When you wash your hands, how many paper towels do you use? No, not how many are you supposed to use – how many do you actually use? Busy restaurants can host thousands of patrons on a daily basis. Imagine how many paper towels are used throughout the course of a day, week, month, or year! Well, buying all those paper towels adds up. A restaurant hand dryer requires an initial purchase and installation, as well as any minor maintenance. That’s it. See how much your restaurant can save with our Cost Savings Calculator. Aside from a simple material cost, public restroom hand dryers also reduce labor costs. Used paper towels can end up anywhere in a public restroom, not just the garbage bin. We’ve seen them on the floor, in the sink, in toilets (clogging them), and even on the ceiling. Regardless of where they end up, facilities must pay an employee to clean them all up. That includes even the ones that end up in a trash bin because that bin must be emptied periodically depending on traffic (daily, twice a day, hourly, etc.). 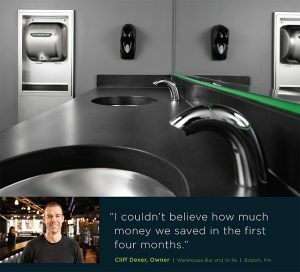 Hand dryers for restaurants eliminate that extra labor cost. Rather than sending your employees to clean up after your guests, you can have them spending more time enhancing the guest experience. One of the best money-making strategies for restaurants is to capitalize on returning and loyal customers. You’ve already done the hard part of getting them in the door for the first time. A dirty, unpleasant restroom can quickly make that their last visit to your restaurant. High-speed hand dryers for restaurants provide a more hygienic, eco-friendly solution than paper towels and conventional hand dryers. Paper towels are, spoiler alert, made from paper. As you know, paper comes from trees. Hand dryers eliminate the need to cut down trees for paper towels, which greatly reduces a facility’s carbon footprint. Remember where all those used paper towels can end up? They not only create more labor, but they give you a bad appearance and increase the spread of germs. And although it may seem like using recycled paper towel is a savings, it isn’t in the end, recycled paper towels cannot be recycled again and goes straight…..to the landfill. Want real-life examples of how public restroom hand dryers have helped restaurants? Check out the case studies below to see how much these facilities saved in cost and labor while reducing their carbon footprint. Dough means everything at the Pizza Shoppe, a pizzeria in Massachusetts. Not just pizza dough, either. After installing public restroom hand dryers, the facility saved money and witnessed other benefits. “XLERATOR has also improved the dining experience for our customers because there is not as much litter and waste in the restrooms from discarded paper towels, and we rarely have any plumbing issues anymore,” said owner Tony Giuggio. This popular spot is located near one of Boston’s busiest tourist attractions: the Freedom Trail. With so many visitors, Bell-in-Hand needed a restroom solution that would save money and increase efficiency. Owner Eddie Kaplan was pleased to install a restaurant hand dryer like XLERATOR. A complete facility renovation led to this restaurant installing the XLERATOR hand dryer. Aside from cost savings and other traditional benefits, Peter Fiumara pointed out that hand dryers for restaurants can lead to other benefits. The Crow’s Nest Restaurant is located in the Santa Cruz Harbor in California. Ownership and management were searching for a “clean, well-maintained facility” and also wanted to “cut down on the maintenance costs.” Learn how the XLERATOR turned out to be the perfect public restroom hand dryers solution. Previous story What Are The Best Hand Dryers For Schools?